"Mary Gilman, Westbrook College, late 1970s"
Westbrook College student Mary Gilman poses for her senior class black and white candid photo, which was taken in the late 1970s. 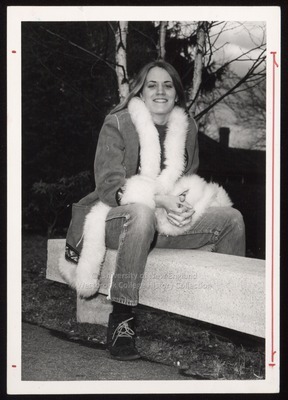 She wore blue jeans with a sheepskin Chamois coat with white / off white fur edging and cuffs. Her hair was long, parted in the middle and hung straight down her back. Mary straddles a stone bench with her hands folded in her lap.